This article is about the Amtrak main line. For the New Jersey Transit service, see Northeast Corridor Line. For the agglomeration of metropolitan areas, see Northeast megalopolis. The Northeast Corridor (NEC) is an electrified railroad line in the Northeast megalopolis of the United States. Owned primarily by Amtrak, it runs from Boston through Providence, New Haven, New York City, Philadelphia through Wilmington, and Baltimore to Washington, D.C. The NEC closely parallels Interstate 95 for most of its length, and is the busiest passenger rail line in the United States by ridership and service frequency as of 2013. The NEC carries more than 2,200 trains daily. Branches to Harrisburg, Pennsylvania, Springfield, Massachusetts, and various points in Virginia are not considered part of the Northeast Corridor, despite frequent service from routes that run largely on the corridor. Much of the line is built for speeds higher than the 79 mph (127 km/h) maximum allowed on many U.S. tracks. Amtrak operates intercity Northeast Regional and Keystone Service trains at up to 125 mph (201 km/h), as well as North America's only high-speed train, the Acela Express, which runs up to 150 mph (240 km/h) on a few sections in Massachusetts and Rhode Island. Acela covers the 225 miles (362 km) between New York and Washington, D.C., in under 3 hours, and the 229 miles (369 km) between New York and Boston in under 3.5 hours. Under Amtrak's $151 billion Northeast Corridor plan, which hopes to roughly halve travel times by 2040, trips between New York and Washington via Philadelphia would take 94 minutes. 5.1 "A vision for High-Speed Rail"
The Northeast Corridor was built by several railroads between the 1830s and 1917. The route was later consolidated under two railroads: the New York, New Haven and Hartford Railroad (NYNH&H) between Boston and New York, and the Pennsylvania Railroad (PRR) between New York and Washington. Boston–Providence: Boston and Providence Railroad opened 1835, partially realigned in 1847 and in 1899. Became part of the Old Colony Railroad in 1888. Providence–Stonington: New York, Providence and Boston Railroad opened 1837; partially realigned 1848. Stonington–New Haven: New Haven, New London and Stonington Railroad opened 1852–1889, realigned in New Haven, 1894. New Haven–New Rochelle: New York and New Haven Railroad opened 1849. New Rochelle–Port Morris: Harlem River and Port Chester Railroad opened 1873. Port Morris–Sunnyside Yard: New York Connecting Railroad (joint venture between NYNH&H and PRR): opened 1917. Sunnyside Yard–Manhattan Transfer: Pennsylvania Tunnel and Terminal Railroad opened 1910. Manhattan Transfer–Trenton: United New Jersey Railroad and Canal Company opened 1834–1839, 1841; partially realigned 1863 and 1870. Trenton–Frankford Junction: Philadelphia and Trenton Railroad opened 1834; partially realigned 1911. Frankford Junction–Zoo Tower: Connecting Railway opened 1867. Zoo Tower–Grays Ferry Bridge: Junction Railroad opened 1863–1866. Grays Ferry–Bayview: Philadelphia, Wilmington and Baltimore Railroad opened 1837–1838, 1866, 1906. Bayview Yard–Baltimore Union Station: Union Railroad opened 1873. Baltimore Union Station–Landover: Baltimore and Potomac Rail Road opened 1872. The New York Central Railroad (NYC) began planning electrification between Grand Central Terminal and the split at Mott Haven after the opening of the first electrified urban rail terminal in 1900, the Gare d'Orsay in Paris, France. Electricity was in use on some branch lines of the NYNH&H for interurban streetcars via third rail or trolley wire. An accident in the Park Avenue Tunnel near the present Grand Central Terminal that killed 17 people on January 8, 1902 was blamed on smoke from steam locomotives; the resulting outcry led to a push for electric operation in Manhattan. The NH announced in 1905 that it would electrify its main line from New York to Stamford, Connecticut. Along with the construction of the new Grand Central Terminal, opened in 1912, the NYC electrified its lines, beginning on December 11, 1906 with suburban multiple unit service to High Bridge on the Hudson Line. Electric locomotives began serving Grand Central on February 13, 1907, and all NYC passenger service into Grand Central was electrified on July 1. NH electrification began on July 24 to New Rochelle, August 5 to Port Chester and October 6, 1907 the rest of the way to Stamford. Steam trains last operated into Grand Central on June 30, 1908, after which all NH passenger trains into Manhattan were electrified. In June 1914, the NH electrification was extended to New Haven, which was the terminus of electrified service for over 80 years. At the same time, the PRR was building its Pennsylvania Station and electrified approaches, which were served by the PRR's lines in New Jersey and the Long Island Rail Road (LIRR). LIRR electric service began in 1905 on the Atlantic Branch from downtown Brooklyn past Jamaica, and in June 1910 on the branch to Long Island City, part of the main line to Penn Station. Penn Station opened September 8, 1910 for LIRR trains and November 27 for the PRR; trains of both railroads were powered by DC electricity from a third rail. PRR trains changed engines (electric to/from steam) at Manhattan Transfer; passengers could also transfer there to H&M trains to downtown Manhattan. On July 29, 1911, NH began electric service on its Harlem River Branch, a suburban branch that would become a main line with the completion of the New York Connecting Railroad and its Hell Gate Bridge. The bridge opened on April 1, 1917, but was operated by steam with an engine change at Sunnyside Yard east of Penn Station until 1918. Electrification of the portion north of New Haven to Providence and Boston had been planned by the NH, and authorized by the company's board of directors shortly before the United States entered World War I. This plan was not carried out because of the war and the company's financial problems. Electrification north of New Haven did not occur until the 1990s, using a 60 Hz system. In 1905, the PRR began to electrify its suburban lines at Philadelphia, an effort that eventually led to 11 kV, 25 Hz AC catenary from New York and Washington. Electric service began in September 1915, with multiple unit trains west to Paoli on the PRR Main Line (now the Keystone Corridor). Electric service to Chestnut Hill (now the Chestnut Hill West Line), including a stretch of the NEC, began March 30, 1918. Local electric service to Wilmington, Delaware, on the NEC began September 30, 1928, and to Trenton, New Jersey, on June 29, 1930. Electrified service between Exchange Place, the Jersey City terminal, and New Brunswick, New Jersey began on December 8, 1932, including the extension of Penn Station electric service from Manhattan Transfer. On January 16, 1933, the rest of the electrification between New Brunswick and Trenton opened, giving a fully electrified line between New York and Wilmington. Trains to Washington began running under electricity to Wilmington on February 12, with the engine change moved from Manhattan Transfer to Wilmington. The same was done on April 9 for trains running west from Philadelphia, with the change point moved to Paoli. In 1933, the electrification south of Wilmington was stalled by the Great Depression, but the PRR got a loan from Public Works Administration to resume work. The tunnels at Baltimore were rebuilt, and electric service between New York and Washington began February 10, 1935. On April 7, the electrification of passenger trains was complete, with 639 daily trains: 191 hauled by locomotives and the other 448 under multiple-unit power. New York–Washington electric freight service began May 20 after the electrification of freight lines in New Jersey and Washington. Extensions to Potomac Yard across the Potomac River from Washington, as well as several freight branches along the way, were electrified in 1937 and 1938. The Potomac Yard retained its electrification until 1981. In the 1930s, PRR equipped the New York–Washington line with Pulse code cab signaling. Between 1998 and 2003, this system was overlaid with an Alstom Advanced Civil Speed Enforcement System (ACSES), using track-mounted transponders similar to the Balises of the modern European Train Control System. The ACSES will enable Amtrak to implement positive train control to comply with the Rail Safety Improvement Act of 2008. In December 1967, the UAC TurboTrain set a speed record for a production train: 170.8 miles per hour (274.9 km/h) between New Brunswick and Trenton, New Jersey. In February 1968, PRR merged with its former rival New York Central Railroad to form the Penn Central (PC). Penn Central was required to absorb the New Haven in 1969 as a condition of the merger, which brought the entire Washington–Boston corridor under the control of a single company. On September 21, 1970, all New York–Boston trains except the Turboservice were rerouted into Penn Station from Grand Central; the Turboservice was moved on February 1, 1971 for cross-platform transfers to the Metroliners. In 1971, Amtrak began operations. As well, various state governments took control of portions of the NEC for their commuter transportation authorities. In January, the State of Massachusetts bought the Attleboro/Stoughton Line in Massachusetts, later operated by the Massachusetts Bay Transportation Authority. The same month, the New York State Metropolitan Transportation Authority bought and Connecticut leased from Penn Central their sections of the New Haven Line, between Woodlawn, Bronx, New York and New Haven, Connecticut. In 1973, the Regional Rail Reorganization Act opened the way for Amtrak to buy sections of the NEC not already been sold to these commuter transportation authorities. These purchases by Amtrak were controversial at the time, and the Department of Transportation blocked the transaction and withheld purchase funds for several months until Amtrak granted it control over reconstruction of the corridor. In February 1975, the Preliminary System Plan for Conrail proposed to stop running freight trains on the NEC between Groton, Connecticut, and Hillsgrove, Rhode Island, but this clause was rejected the following month by the U.S. Railway Association. By April 1976, Amtrak owned the entire NEC except Boston to the RI state line which is owned by the Commonwealth of Massachusetts and New Haven to the New Rochelle, New York, which is owned by States of Connecticut and New York. Amtrak still operates and maintains the portion in Massachusetts, but the line from New Haven to New Rochelle, New York, is operated by the Metro-North Railroad, which has hindered the establishment of high-speed service. In 1976, Congress authorized an overhaul of the system between Washington and Boston. Called the Northeast Corridor Improvement Project (NECIP), it included safety improvements, modernization of the signaling system by General Railway Signal, and new Centralized Electrification and Traffic Control (CETC) control centers by Chrysler at Philadelphia, New York and Boston. It allowed more trains to run faster and closer together, and set the stage for later high-speed operation. NECIP also introduced the AEM-7 locomotive, which lowered travel times between cities and became the most successful engine on the Corridor. The NECIP set travel time goals of 2 hours and 40 minutes between Washington and New York, and 3 hours and 40 minutes between Boston and New York. These goals were not met because of the low level of funding provided by the Reagan Administration and Congress in the 1980s. 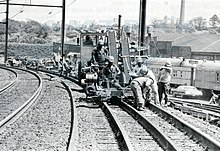 A project for electrification between New Haven and Boston was included in the 1976 Railroad Revitalization and Regulatory Reform Act. All grade crossings on the line have been eliminated between New York and Washington since the mid-1980s. Eleven grade crossings remain in Connecticut. Amtrak Acela Express crosses the Susquehanna River in Maryland on a bridge built by the PRR in 1906. In the 1990s, Amtrak upgraded the NEC north of New York to ready it for the high-speed Acela Express trains. Dubbed the Northeast High Speed Rail Improvement Program (NHRIP), the effort eliminated grade crossings, rebuilt bridges, and modified curves. Concrete railroad ties replaced wood ties, and heavier continuous welded rail (CWR) was laid down. In 1996, Amtrak began installing electrification gear along the 157 miles (253 kilometres) of track between New Haven and Boston. 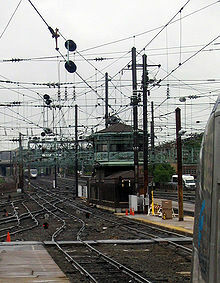 The infrastructure included a new overhead catenary wire made of high-strength silver-bearing copper, specified by Amtrak and later patented by Phelps Dodge Specialty Copper Products of Elizabeth, New Jersey. 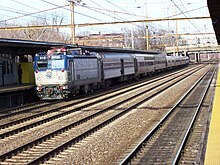 Service with electric locomotives between New Haven and Boston began on January 31, 2000. The project took four years and cost close to $2.3 billion: $1.3 billion for the infrastructure improvements, and close to $1 billion for both the new Acela Express trainsets and the Bombardier–Alstom HHP-8 locomotives. In 2005, there was talk in Congress of splitting the Northeast Corridor, which was opposed by then acting Amtrak president David Gunn. The plan, supported by the Bush administration, would "turn over the Northeast Corridor - the tracks from Washington to Boston that are the railroad's main physical asset - to a federal-state consortium." With the passage of the Passenger Rail Investment and Improvement Act of 2008, the Congress established the Northeast Corridor Commission (NEC Commission) in the U.S. Department of Transportation to facilitate mutual cooperation and planning and to advise Congress on Corridor rail and development policy. The commission members include USDOT, Amtrak and the Northeast Corridor states. In August 2011, the United States Department of Transportation committed $450 million to a six-year project to support capacity increases on one of the busiest segments on the NEC, a 24-mile (39 km) section between New Brunswick and Trenton, passing through Princeton Junction. The Next Generation High-Speed project is designed to upgrade electrical power, signal systems, and overhead catenary wires to improve reliability and increase speeds up to 160 mph (260 km/h), and after the purchase of new equipment, up to 186 miles per hour (299 km/h). In September 2012, speed tests were conducted using Acela train sets, achieving a speed of 165 miles per hour (266 km/h). The improvements were scheduled to be completed in 2016, but have been delayed; the project is now scheduled to be finished in 2019. Eleven minutes after leaving 30th Street Station in Philadelphia on May 12, 2015, a year-old ACS-64 locomotive (#601) and all seven Amfleet I coaches of Amtrak's northbound Northeast Regional (TR#188) derailed at 9:21pm at Frankford Junction in the Port Richmond section of the city while entering a 50 mph (80 km/h) speed limited (but at the time non-ATC protected) 4º curve at 106 mph (171 km/h), killing eight and injuring more than 200 (eight critically) of the 238 passengers and five crew on board as well as causing the suspension of all Philadelphia–New York NEC service for six days. This was the deadliest crash on the Northeast Corridor since 16 died when Amtrak's Washington–Boston Colonial (TR#94) rear-ended three stationary Conrail locomotives at Gunpow Interlocking near Baltimore on January 4, 1987. Frankford Junction curve was the site of a previous fatal accident on September 6, 1943 when an extra section of the PRR's Washington to New York Congressional Limited derailed there killing 79 and injuring 117 of the 541 on board. The NEC is a cooperative venture between Amtrak and various state agencies. Amtrak owns the track between Washington and New Rochelle, New York, a northern suburb of New York City. The segment from New Rochelle to New Haven is owned by the states of New York and Connecticut; Metro-North Railroad commuter trains operate there. Amtrak owns the tracks north of New Haven to the border between Rhode Island and Massachusetts. The final segment from the border north to Boston is owned by the Commonwealth of Massachusetts. At just over 453 miles (729 km), the Northeast Corridor is the longest electrified rail corridor in the United States. Most electrified railways in the country are for rapid transit or commuter rail use; the Keystone Corridor is the only other electrified intercity mainline. Currently, the corridor uses three catenary systems. From Washington, D.C., to Sunnyside Yard (just east of New York Penn Station), Amtrak's 25 Hz traction power system (originally built by the Pennsylvania Railroad) supplies 12 kV at 25 Hz. From Sunnyside to Mill River (just east of New Haven), the former New Haven Railroad's system, since modified by Metro-North, supplies 12.5 kV at 60 Hz. From Mill River to Boston, the much newer 60 Hz traction power system supplies 25 kV at 60 Hz. All of Amtrak's electric locomotives can switch between these systems at speed. In addition to catenary, the East River Tunnels have 750 V DC third rail for Long Island Rail Road trains, and the North River Tunnels have third rail for emergency use only. In September 2013, one of two feeder lines supplying power to the New Haven Line failed, while the other feeder was disabled for service. The lack of electrical power disrupted trains on Amtrak and Metro-North Railroad, which share the segment in New York State. There are 109 active stations on the Northeast Corridor; 30 are used by Amtrak. All but three (Kingston, Westerly, and Mystic) see commuter service. Amtrak owns Pennsylvania Station in New York, 30th Street Station in Philadelphia, Pennsylvania Station in Baltimore, and Union Station in Washington. LIRR: Served by the Long Island Rail Road City Terminal Zone portion of Main Line trains to Penn Station. MBTA: Served by MBTA Providence/Stoughton Line, Franklin Line, Needham Line, and / or Framingham/Worcester Line trains. MNR: Served by MTA Metro-North Railroad New Haven Line, Danbury Branch, New Canaan Branch, and / or Waterbury Branch trains. NJT: Served by New Jersey Transit Atlantic City Line, Montclair-Boonton Line, Morristown Line, Gladstone Branch, North Jersey Coast Line, and / or Northeast Corridor Line trains. SEPTA: Served by SEPTA Regional Rail Airport Line, Wilmington/Newark Line, Media/Elwyn Line, Trenton Line, and / or Chestnut Hill West Line trains. The entire Northeast Corridor has just 11 grade crossings, all in southeastern New London County, Connecticut. The remaining grade crossings are along a part of the line that hugs the shore of Fishers Island Sound. Without these crossings many waterfront communities and businesses would be inaccessible from land. Except for three grade crossings near New London Union Station, all have four-quadrant gates with induction loop sensors, which allow vehicles stopped on the tracks to be detected in time for an oncoming train to stop. The New York to New Haven line has long been completely grade-separated, and the last grade crossings between Washington and New York were eliminated in the 1980s. In 1994, during planning for electrification and high-speed Acela Express service between New Haven and Boston, a law was passed requiring USDOT to plan for the elimination of all remaining crossings (unless impractical or unnecessary) by 1997. Some lightly used crossings were simply closed, while most were converted into bridges or underpasses. Only thirteen remained by 1999, of which lightly used crossings in Old Lyme, Connecticut and Exeter, Rhode Island were soon closed. On September 28, 2005, a southbound Acela Express struck a car at Miner Lane in Waterford, Connecticut, the first such incident since the additional protections were implemented. The train was approaching the crossing at approximately 70 miles per hour (110 km/h) when the car reportedly rolled under the lowered crossing gate arms too late for the sensor system to fully stop the train. The driver and one passenger were killed on impact; the other passenger died nine days later from injuries sustained in the crash. The gates were later inspected and declared to have been functioning properly at the time of the incident. The incident drew public criticism about the remaining grade crossings along the busy line. 140.6 Stonington Palmer Street 500263U 41°22′21″N 71°50′08″W﻿ / ﻿41.372491°N 71.835678°W﻿ / 41.372491; -71.835678 Connects the Pawcatuck residential area to the Mechanic Street arterial. 136.7 Elihu Island Road 500267W 41°20′27″N 71°53′24″W﻿ / ﻿41.340922°N 71.889912°W﻿ / 41.340922; -71.889912 Provides sole access to Elihu Island. Private crossing. 136.6 Walker's Dock 500269K 41°20′24″N 71°53′28″W﻿ / ﻿41.340073°N 71.891184°W﻿ / 41.340073; -71.891184 Provides sole access to a small marina. Private crossing. 134.9 Wamphassuc Road 500272T 41°20′31″N 71°55′18″W﻿ / ﻿41.342016°N 71.921605°W﻿ / 41.342016; -71.921605 Provides sole access to a residential area. 133.4 Latimer Point Road 500275N 41°20′29″N 71°56′56″W﻿ / ﻿41.341312°N 71.948967°W﻿ / 41.341312; -71.948967 Provides sole access to a residential area. 132.3 Broadway Avenue Extension 500277C 41°21′03″N 71°57′50″W﻿ / ﻿41.350813°N 71.963872°W﻿ / 41.350813; -71.963872 Next to Mystic station. Provides sole access to a residential and industrial area, several marinas, and the northbound platform. 131.2 Groton School Street 500278J 41°20′42″N 71°58′38″W﻿ / ﻿41.344933°N 71.977092°W﻿ / 41.344933; -71.977092 Provides sole access to the Willow Point residential area and marina. 123.0 New London Ferry Street 500294T 41°21′25″N 72°05′41″W﻿ / ﻿41.356984°N 72.094777°W﻿ / 41.356984; -72.094777 Provides sole access to Block Island Ferry and Cross Sound Ferry docks and other marine facilities. Does not have quad gates. 122.8 State Street 500295A 41°21′14″N 72°05′35″W﻿ / ﻿41.353845°N 72.092991°W﻿ / 41.353845; -72.092991 Next to New London Union Station. Provides access to the Fisher's Island Ferry, City Pier, Waterfront Park, and the northbound platform. 122.5 Bank Street Connector 500297N 41°21′05″N 72°05′45″W﻿ / ﻿41.35128°N 72.095957°W﻿ / 41.35128; -72.095957 Provides access to Waterfront Park. 120.2 Waterford Miner Lane 500307S 41°20′09″N 72°07′26″W﻿ / ﻿41.335726°N 72.123845°W﻿ / 41.335726; -72.123845 Provides sole access to a residential and industrial area. Acela Express: high-speed rail Boston–Washington, D.C. The New Haven–Springfield Shuttle: New Haven–Springfield, Massachusetts via the Amtrak-owned New Haven–Springfield branch line of the NEC. Five Amtrak services operate via the Empire Corridor, a line largely owned by CSX, with other sections owned by Metro-North Railroad and Amtrak. It meets the NEC at New York Penn Station. Empire Service: higher-speed rail Niagara Falls–New York; most trains terminate at Albany–Rensselaer with two trains continuing to Niagara Falls. The Capitol Limited runs from Washington, D.C.–Chicago and uses NEC infrastructure at Washington Union Station. Freight trains operate on parts of the NEC through trackage rights. The Norfolk Southern Railway operates over the line south of Philadelphia. CSX Transportation has rights from New York to New Haven; in Massachusetts; and in Maryland from Landover, where its Landover Subdivision joins the NEC, to Bowie, where its Pope's Creek Subdivision leaves it. Between Philadelphia and New York, Conrail operates as a local switching and terminal company for CSX and Norfolk Southern (see Conrail Shared Assets Operations). The Providence and Worcester Railroad operates local freight service from New Haven into Rhode Island and has overhead trackage rights from New Haven to New York (see Rail freight transportation in New York City and Long Island). As of 2013, the Federal Railroad Administration is drawing up a master plan for developing the corridor through 2040, taking into account various projects and proposals by various agency and advocacy groups. The plan is to be complete in spring 2015. Much of the proposed improvements are unfunded. The proposed alignment would closely follow the existing NEC south of New York City; north of the city, several different alignments would be studied. One option would parallel Interstates 684, 84, and 90 through Danbury, Waterbury, and Hartford, Connecticut; another would follow the existing shoreline route (paralleling Interstate 95); a third would run along Long Island and a new bridge or tunnel across Long Island Sound to Connecticut. In February 2011, Amtrak announced plans for the Gateway Project between Newark Penn Station and New York Penn Station. The planned project would create a high-speed alignment across the New Jersey Meadowlands and under the Hudson River, including the replacement of the Portal Bridge, a bottleneck. It is projected to cost $14.5 billion and be completed in 2025. In May 2011, a $294.7-million federal grant was awarded to fix congestion at Harold Interlocking, the USA's second-busiest rail junction after Sunnyside Yard. The work will lay tracks to the New York Connecting Railroad right of way, allowing Amtrak trains arriving from or bound for New England to avoid NJT and LIRR trains. Financing for the project was jeopardized in July 2011 by the House of Representatives, which voted to divert the funding to unrelated projects. The project is currently funded by FRA and the MTA. In August 2011, Congress obligated $450 million to a six-year project to add capacity on one of the busiest segments on the NEC in New Jersey. The project is designed to upgrade electrical power, signal systems and catenary wires on a 24-mile (39 km) section between New Brunswick and Trenton to improve reliability, increase speeds up to 160 mph (260 km/h), and support more frequent high-speed service. The improvements were scheduled to be completed in 2016, but have been delayed; the project is now scheduled to be finished in 2019. The track work is one of several projects planned for the "New Jersey Speedway" section of the NEC, which include a new station at North Brunswick, the Mid-Line Loop (a flyover for reversing train direction), and the re-construction of County Yard, to be done in coordination with NJT. Amtrak has applied for $15 million for the environmental impact studies and preliminary engineering design to examine replacement options for the more than 100-year-old, low-level movable rail Pelham Bay Bridge (just west of Pelham Bridge) over the Hutchinson River in the Bronx that has been limiting speed and train capacity. The goal is for a new bridge to support expanded service and speeds up to 110 mph (180 km/h). 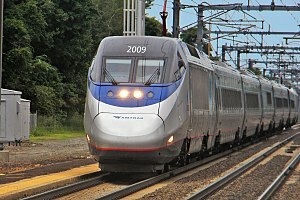 On August 26, 2016, Vice President Joe Biden announced a $2.45 billion federal loan package to pay for new Acela equipment, as well as upgrades to the NEC. The loans will finance 28 trainsets that will replace the existing fleet. The trains will be built by Alstom in Hornell and Rochester, New York. Passenger service using the new trains is expected to begin in 2021 and the current fleet is to be retired by the end of 2022 when all the replacements will have been delivered. Amtrak will pay off the loans from increased NEC passenger revenue. In December 2016, the NEC Future's final environmental impact statement was released. On July 12, 2017, the Federal Railroad Administration revealed the record of decision for the project. ^ "Amtrak FY16 Ridership and Revenue Fact Sheet" (PDF). Amtrak. April 7, 2017. Retrieved October 13, 2017. ^ "Transportation Statistics Annual Report" (PDF). Bureau of Transportation Statistics, U.S. Department of Transportation. November 2005. Retrieved February 18, 2007. ^ Young, Elise; Pogkas, Demetrios (March 5, 2018). "How Trump's Hudson Tunnel Feud Threatens the National Economy". Bloomberg News. Retrieved March 6, 2018. 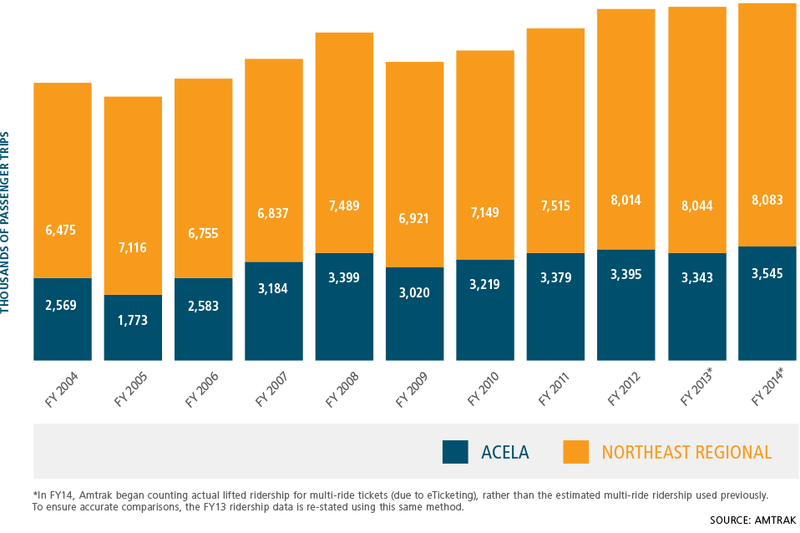 ^ "Amtrak fact sheet: Acela service" (PDF). narprail.org. National Association of Railroad Passengers. 2013. Retrieved May 6, 2016. ^ Wolmar, Christian (March 7, 2010). "High-Speed Rail Investment Should Focus on Acela". The New York Times. ISSN 0362-4331. Retrieved May 6, 2016. ^ Roberts, Sam (January 18, 2013). "The Birth of Grand Central Terminal". The New York Times. Retrieved November 8, 2015. ^ Sam Roberts (January 22, 2013). Grand Central: How a Train Station Transformed America. Grand Central Publishing. ISBN 978-1-4555-2595-9. ^ "WGBH American Experience: Grand Central". PBS. January 8, 1902. Retrieved November 8, 2015. ^ "P.R.R. WILL SPEND $77,000,000 AT ONCE; Atterbury Outlines Projects Under PWA Loan Giving Year's Work to 25,000. TO EXTEND ELECTRIC LINE Sees Buying Power Restored and Industry Stimulated by Wide Building Program". The New York Times. January 31, 1934. Retrieved August 8, 2012. ^ "Acses to speed NE Corridor". Railway Gazette. September 1, 1998. Retrieved April 22, 2018. ^ William D. Middleton (December 1999). "Passenger rail in the 20th Century". Railway Age. Archived from the original on May 4, 2007. Retrieved November 13, 2006. ^ a b Baer, Christopher T. (April 2015). "A GENERAL CHRONOLOGY OF THE PENNSYLVANIA RAILROAD COMPANY ITS PREDECESSORS AND SUCCESSORS AND ITS HISTORICAL CONTEXT" (PDF). The Pennsylvania Railroad Technical & Historical Society. Retrieved May 6, 2016. ^ a b U.S. Congress. Railroad Revitalization and Regulatory Reform Act of 1976, Pub. L. 94-210, 90 Stat. 31, 45 U.S.C. § 801. February 5, 1976. Sometimes referred to as the "4R Act." ^ USDOT. "NECIP Redirection Study. "[dead link] January 1979. p. 1. ^ a b NEC Master Plan Working Group. "NEC Infrastructure Master Plan." May 2010. pp. 19-20. ^ "Copper trolley wire and a method of manufacturing copper trolley wire". ^ "Amtrak's New High-Speed Service Is Derailed by Mechanical Problem". Associated Press. December 13, 2000 – via LA Times. ^ "Timetables (see Northeast Corridor 1–3)". Amtrak. Retrieved April 22, 2018. ^ Wald, Matthew (November 9, 2005). "Amtrak's President Is Fired by Its Board". New York Times. Retrieved May 14, 2015. ^ a b Schned, Dan (August 24, 2011). "U.S. DOT Obligates $745 Million to Northeast Corridor Rail Projects". America 2050. Retrieved November 24, 2011. ^ Frassinelli, Mike (September 25, 2012). "Amtrak train looks to break U.S. speed record in Northeast Corridor test". The Star-Ledger. Retrieved December 17, 2012. ^ Higgs, Larry (September 14, 2017). "160 mph trains will speed from Trenton to New Brunswick by 2020". New Jersey On-Line. Retrieved December 27, 2017. ^ Mouawad, Jad (May 14, 2015). "Technology That Could Have Prevented Amtrak Derailment Was Absent". The New York Times. ^ Nussbaum, Paul; Wood, Anthony R. (May 14, 2015). "Automatic braking was in place on other side of curve". The Philadelphia Inquirer. ^ "Rear-End Collision of Amtrak Passenger Train 94, The Colonial and Consolidated Rail Corporation Freight Train ENS-121, on the Northeast Corridor on January 4, 1987" (PDF). NTSB. January 25, 1988. ^ "Interstate Commerce Commission, Investigation No. 2726, The Pennsylvania Railroad Co. Report: IN RE; Accident at Shore, PA., on September 6, 1943". October 1, 1943. Archived from the original on May 13, 2015. ^ "Still No Answers in May Amtrak Power Outage". WNYC. June 22, 2006. Retrieved November 13, 2006. ^ "Malloy: 'Catastrophic Failure' On Metro-North New Haven Line". CBS New York. September 26, 2013. Retrieved October 5, 2013. ^ "Section 4: Identification of Alternatives". Railroad-Highway Grade Crossing Handbook (2 ed.). Federal Highway Administration. August 2007. Archived from the original on May 23, 2015. Retrieved March 22, 2015. ^ "49 U.S.C. 24906 - ELIMINATING HIGHWAY AT-GRADE CROSSINGS". U.S. Government Publishing Office. Retrieved March 22, 2015. ^ a b Dee, Jane E. (March 29, 1999). "Rail Crossings Safety Issue For Amtrak". Hartford Courant. Retrieved March 22, 2015. ^ "Stuck crossing gate strands drivers on wrong side of the tracks". The Day. November 4, 1999. Retrieved March 22, 2015. ^ O'Donnell, Noreen (February 5, 2015). "Technology Solution? Sensors Could Warn Trains of Cars on Tracks". NBC Bay Area. Retrieved March 22, 2015. ^ Dee, Jane E. (September 9, 1999). "Amtrak To Put Up 7 Safer Gates". Hartford Courant. Retrieved March 22, 2015. ^ McGeehan, Patrick & Wald, Matthew L. (September 30, 2005). "High-Tech Gates Fail to Avert Car-Train Crash". The New York Times. Retrieved September 2, 2008. ^ "Investigators Seek Answers In Fatal Crash That Killed Two; Cause of Waterford car-train accident may never be known". The New London Day. September 30, 2005. ^ "Family sues over fatal car crash on railroad tracks". The Boston Globe. Associated Press. December 27, 2006. Archived from the original on December 27, 2008. ^ a b c d "Amtrak System Safety Program" (PDF). December 2007. pp. 22–3. Retrieved March 22, 2015. ^ "Passenger ridership" (PNG). Amtrak. Archived from the original on March 5, 2016. Retrieved November 5, 2015. ^ O'Toole, Randal (June 29, 2011). "Intercity Buses: The Forgotten Mode". Policy Analysis (680). ^ "Providence and Worcester Railroad". Genesee & Wyoming. Retrieved April 22, 2018. ^ "NEC FUTURE: Tier 1 Final EIS". ^ "The 8 Most Critical Rail Projects That Amtrak Can't Afford". ^ "Japan Pitches Its High-Speed Train With an Offer to Finance". The New York Times. ^ "Amtrak Releases Concept for 220 mph Train Along Northeast Corridor". AASHTO Journal. Archived from the original on October 7, 2010. Retrieved October 10, 2010. ^ "A Vision for High-Speed Rail in the Northeast Corridor" (PDF). Amtrak. September 2010. Retrieved July 24, 2013. ^ "N.Y. to D.C., 96 mins., $117 billion". CNN Money. November 2, 2010. ^ Nussbaum, Paul (May 12, 2012). "N.J. to contribute to proposed Amtrak tunnel". The Philadelphia Inquirer. Archived from the original on March 3, 2018. Retrieved March 3, 2018. ^ "Maloney Hails Federal Grant to Ease Amtrak Delays in NYC, Spur High-Speed Rail in NE Corridor - $294.7 Million Grant to Improve "Harold Interlocking", a Delay-Plagued Junction For Trains in the NE Corridor". Congresswoman Carolyn B. Maloney. May 9, 2011. Retrieved May 13, 2011. ^ Colvin, Jill (May 9, 2011). "New York Awarded $350 Million for High-Speed Rail Projects". DNAinfo.com. Archived from the original on September 8, 2015. Retrieved May 13, 2011. ^ "House Vote Jeopardizes Key Northeast Rail Projects". Back on Track: Northeast. The Business Alliance for Northeast Mobility. July 20, 2011. Archived from the original on September 30, 2011. Retrieved July 21, 2011. ^ "Harold Interlocking Northeast Corridor Congestion Relief Project". Metropolitan Transit Authority (New York). Retrieved April 30, 2016. ^ Frassinelli, Mike (May 9, 2011). "Feds steer $450M to N.J. for high-speed rail". The Star Ledger. Retrieved May 13, 2011. ^ Thorbourne, Ken (May 9, 2011). "Amtrak to receive nearly $450 million in high speed rail funding". The Jersey Journal. Retrieved May 13, 2011. ^ Vantuono, William C (June 11, 2013). "Amtrak sprints toward a higher speed future". Railway Age. Retrieved January 19, 2014. ^ "Amtak Seeks $1.3 billion for Gateway Project and Next-Generation High-Speed Rail on Northeast Corridor". Amtrak. April 4, 2011. Archived from the original on May 3, 2011. Retrieved April 8, 2011. ^ Aratani, Lori (August 26, 2016). "Biden announces upgrades for Amtrak's Northeast Corridor". Washington Post. ^ "NEC FUTURE: Tier 1 Final EIS". NEC Future. Retrieved April 22, 2018. ^ "FRA unveils record of decision for NEC FUTURE project". Progressive Railroading. July 13, 2017. Retrieved April 22, 2018. Middleton, William D. (March 2003). "Super Railroad". Trains. 63 (3): 36–59. ISSN 0041-0934. New York Division (Map). Pennsylvania Railroad. 1963. Wikimedia Commons has media related to Northeast Corridor. Historic American Engineering Record (HAER) No. MA-19, "Northeast Railroad Corridor"
HAER No. RI-19, "Northeast Railroad Corridor"
HAER No. CT-11, "Northeast Railroad Corridor"
HAER No. NY-121, "Northeast Railroad Corridor"
HAER No. NJ-40, "Northeast Railroad Corridor"
HAER No. DE-21, "Northeast Railroad Corridor"
HAER No. MD-45, "Northeast Railroad Corridor"
HAER No. DC-3, "Northeast Railroad Corridor"